The I-49 South Coalition supports adoption of Constitutional Amendments No. 1 and No. 2 in order to create greater funding options and flexibility for transportation infrastructure projects. On October 24, 2015, Louisiana’s voters will be given the opportunity to advance the state’s aging transportation infrastructure. The I-49 South Coalition encourages voters to vote ‘YES’ on Amendments No. 1 and No. 2. Authorize the state treasurer to invest existing, idle state funds into the Louisiana State Transportation Infrastructure Bank created in 2015. Click here to learn more about these proposed amendments. Check out this commercial promoting I-49 South! BROUSSARD – The completion of the I-49 South Corridor was the focus of One Acadiana’s final installment of its conference Thursday at Billeaud Companies. The remaining cost of the project, which would transform the 160-mile stretch of U.S. 90 from Lafayette to New Orleans into an interstate, is about $3 billion. That’s the project’s biggest hurdle, One Acadiana President and CEO Jason El Koubi said. But efforts to complete the corridor “one bite at a time” are underway, its advocates said Thursday. One Acadiana officials were joined by representatives of Billeaud Co., Schilling Distribution, state lawmakers and the I-49 South Coalition, which is now housed within One Acadiana. As the fourth and final installment of the regional chamber’s “Priorities for a Better Acadiana” series, the organization emphasized that the completion of I-49 South is its top priority. Transforming U.S. 90 into a major corridor could also boost economic growth in South Louisiana by attracting oil and gas industry expansion. It would also improve hurricane evacuation, officials said. Although funding is scarce for the project, it should be in the forefront of the priority list for state and federal lawmakers, I-49 South Coalition Chairman David Mann said. There’s already $12 billion worth of infrastructure projects in the state’s backlog. Moody’s Investors Services has given Louisiana a favorable Aa3 rating on $73.7 million in unclaimed property revenue bonds that will be used to continue work on completing Interstate 49 South, State Treasurer John Kennedy said in an issued statement Thursday. Kennedy said he intends to sell some $70 million to $80 million in bonds, probably within the next few weeks. He said his office is waiting for additional credit ratings to arrive, including one from Standard & Poor’s, in order to bolster the state’s financial reputation and lower the interest the state will pay. He said S&P may respond within the next few days, perhaps as early as Friday, but he cautioned that the ratings services operate independently; there’s no guarantee S&P will issue a favorable report. “This is a victory for the citizens of Louisiana,” Kennedy said of Moody’s assessment, which came Thursday. “Moody’s could have downgraded us, but they didn’t. They have left us on negative credit watch, and Moody’s is giving new leadership time to fix our problems.” Louisiana will hold state elections on Oct. 24. Kennedy said he asked Moody’s not to lower the state’s credit rating, which he said was a possibility. “Moody’s kept us on a negative credit watch,” he said, “but they aren’t going to downgrade us. They will wait for new leadership in Baton Rouge: a new governor, a new Legislature and new officials. Kristy Nichols, commissioner of administration, was more upbeat about the state’s finances. “Today’s affirmation from Moody’s reflects that we made concrete progress in structurally balancing the state’s budget. I’m confident that the outlook will improve in the future as the ratings agencies see that we have been responsive in addressing their concerns,” she said in an issued statement. Louisiana’s bond sale will finance construction on portions of I-49 South, a top priority locally for One Acadiana and, before it, for the Greater Lafayette Chamber of Commerce. Excess annual collections from the unclaimed property program pay the debt service on the bonds without anyone losing unclaimed property money, Kennedy said. As treasurer, Kennedy is authorized by the Legislature to sell up to $200 million in bonds for the highway financing; his office sold $113 million in December 2013. Eighty million dollars more would keep him within the Legislature’s limit. Kennedy said that the bonds are usually purchased by large institutional investors like Fidelity Investments or Goldman Sachs, although some individuals buy government bonds. The upcoming bond sale will be used to match federal funds to finance U.S. 90 from Albertson Parkway in Broussard to just north of Ambassador Caffery and the U.S. 90/LA 318 interchange project in St. Mary Parish. The projects are part of a multi-year effort to convert 160 miles of the current U.S. 90 corridor from Lafayette to New Orleans into Interstate 49. To the good, Moody’s noted the state made progress in narrowing its budget imbalance for 2016 and revenues generated by its recent share of the $18.7 billion settlement with BP over the 2010 Deepwater Horizon incident. Nichols said the report notes that the fiscal 2016 budget closed a gap of about $1.6 billion by increasing recurring revenues, reducing the use of one-time funding sources to about $550 million and implementing cost savings. Greater Baton Rouge Business Report – I-49 South has been in the works for decades. But the $3 billion project is coming together, mile by mile. The signs are still there, strung along U.S. 90 in Lafayette, hinting at an impending interstate that will someday connect the Hub City to the Crescent City. “Future I-49 Corridor,” they read. These signs are nothing new. I-49 South has been in the works since 1987. So after all these years, what is the status of the proposed interstate corridor? Has the initiative died off or is it still moving forward? The Department of Transportation and Development says the project is, in fact, alive and well. Over the years, I-49 South has gradually progressed piece by piece. Today the future corridor is more than 50% complete, and several groups, businesses and legislators have gotten behind the push to finish the project. I-49 South, known as the “Energy Corridor,” comprises the final, 160-mile leg of the interstate that runs along what is now U.S. 90 from Lafayette to New Orleans. Much of the intended route, an estimated 100 miles, is already up to interstate standards, but about 60 miles remain undone, including pricey portions through Lafayette and from Raceland to New Orleans. Mann and other proponents say the future corridor will significantly benefit not only Acadiana, but the entire state, by enhancing economic development, increasing safety, reducing travel times and providing an alternate hurricane evacuation route. “Safety is number one,” says Doug Place, executive vice president of Dupre Logistics, a trucking services company based in Lafayette with locations around the country. Place says the company’s truck drivers often travel from I-10 in Lafayette to New Iberia, where a number of accidents occur. Having an interstate to travel on, instead of U.S. 90 with traffic and stoplights, would greatly reduce risks and provide a safer, more efficient commute. 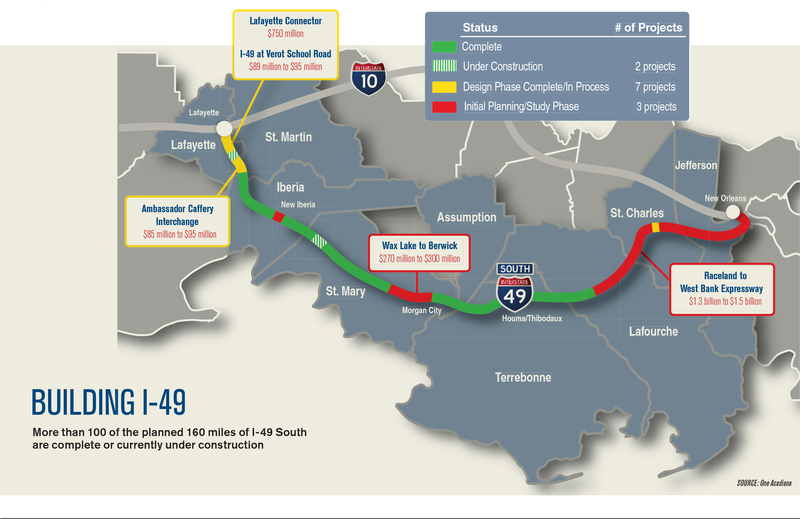 Another justification for I-49 South is that it gives commuters driving from Lafayette to New Orleans another route to take instead of I-10, which is infamous for its traffic delays on the Atchafalaya Basin Bridge and when entering Baton Rouge. Place also stressed the importance of I-49 as an alternate hurricane evacuation route. The benefits of the future corridor are clear, but the project has been a long time coming, and people may have lost faith in it along the way. Yet, there seems to be reason for hope again. Securing funds for projects like I-49 South is often what holds up the construction process, but proponents say government officials are beginning to recognize the need for the corridor and looking at ways to fund it. As head of One Acadiana, El Koubi has had the opportunity to talk to hundreds of business owners across Acadiana who have told him I-49 South is a top priority for them. In response, One Acadiana has made the future corridor its top priority as well. The organization is working to sustain momentum, get the word out and accelerate funding and design plans for I-49 South. Members are also collaborating with gubernatorial candidates to put their support behind the project. El Koubi says the corridor will have a huge economic impact, especially for the state’s the oil and gas industry as these products are frequently transported along the route, and it will increase tourism in Louisiana by providing a “more robust linkage” between two major tourist areas: New Orleans and Acadiana. The entirety of I-49 South will cost an estimated $3 billion, says Deidra Druilhet, a spokeswoman at the DOTD. But that price is just half of what the project was originally expected to cost. Several separate sections make up I-49 South. Most have been completed and some are currently being worked on, such as the U.S. 90 Interchange at Ambassador Caffery in Broussard, where the road will be widened to six lanes. DOTD will also soon award a design-build contract for the U.S. 90 Interchange at LA 318 in St. Mary Parish, expected to begin in late 2015 or early 2016. A number of smaller projects, like creating frontage and service roads, have also been completed over the years. One of the major sections left is the $750-million Lafayette Connector, which will run from I-10 to Pinhook Road, just past the Lafayette Regional Airport. Druilhet said design work for the connector is set to begin this summer. The other major project is the route from Raceland to the West Bank Expressway, which is in the initial planning stage. Although a final completion date for I-49 South has not been set, DOTD is fully committed to seeing the project through. The Louisiana Department of Transportation and Development announced Monday that it has signed a design-build contract, as part of the Geaux South program, for the construction of the U.S. 90 (future I-49 South) at Louisiana 318 interchange project in St. Mary Parish. The design-build contractor is Gilchrist Construction Co., who has selected Stantec as its lead designer. The project will involve upgrading the existing U.S. 90 and Louisiana 318 signalized intersection to a full control of access, grade-separated interchange including the reconstruction of the U.S. 90 frontage roads to provide local access to Louisiana 318. As part of the plan, the project would improve connectivity for industrial and freight transport to the sugar mill and port-related industries, as well as increase capacity and improve overall mobility. The $56 million project will be primarily funded with unclaimed property funds. Work is estimated for completion in just over two years. The Geaux South program is a $3 billion program dedicated to upgrading U.S. 90 to interstate standards. Interstate 49 south efforts are making incremental progress, with a favorable bid received for reworking an intersection in St. Mary Parish and design plans progressing on the route that will link Shreveport to New Orleans, mostly along U.S. Highway 90. But the big money for executing the project from Lafayette to New Orleans, the southern portion of the route in Louisiana, may not show up until 2020, when the department hopes to capitalize on additional funding scheduled to be gained through the Vehicle Sales Tax. In response to a question from state Sen. Bret Allain, R-Franklin, Secretary of Transportation and Development Sherri LeBas told the Senate Finance Committee on Monday that bids were taken for work at the intersection of U.S. 90 and La. 318 in St. Mary Parish, along the route. The low bid of about $55 million came in about $4 million under the projection; a contract may be signed by May or June. LeBas said that St. Mary project would leave an intersection at U.S. 90 and Ambassador Caffery in Lafayette and an intersection of U.S. and La. 88 in St. Martin Parish as the lone projects remaining for I-49 south below the Lafayette airport to St. Mary. The remainder of the route between those points meet standards for interstate highways. LeBas said a consultant is at work on the Lafayette Connector, which would run from Interstate 10 to Pinhook Road. The good news, she said, is that design work is progressing and will be well along when the Vehicle Sales Tax money — she said it would provide around $400 million a year — becomes available, probably in 2020. The Lafayette Connector alone will cost about $750 million. LeBas appeared before the finance committee Monday morning to discuss her department’s Fiscal Year 2016 budget. Sen. Eric LaFleur, D-Ville Platte, expressed concern to LeBas about state bridges that were out of service in his area, which includes St. Landry Parish, especially bridges in rural areas. He asked about the possibility of building lower-cost bridges, perhaps using timber, to replace some of those. He suggested it might be better to build several lower-cost bridges than one expensive bridge. LeBas said she would review that possibility. Department of Public Safety Secretary James LeBlanc told the Senate Finance committee that the state prison population is declining and the average cost of housing a prisoner remains lower in Louisiana than elsewhere. He said the state pays $36.59 a day to house a prisoner, on average. That includes state, local and private facilities. The cost of housing a prisoner in North Carolina is some $75 a day, one committee member said. Nonetheless, Louisiana continues to have the country’s highest incarceration rate: about 840 prisoners per 100,000 people, LeBlanc said. LeBlanc said the projected fiscal 2016 budget of $785.6 million was OK and that reductions of some $25 million were “manageable,” given the decrease in prisoners. Col. Mike Edmonson, superintendent of Louisiana State Police, said State Police had 1,015 state trooper commissioned officers as of January. The number of troopers had been as low as 917, after five years with no trooper classes. Edmonson said one class was graduated in 2014, one graduated earlier this year and a third class will graduate by the end of the year. He said the recommended budget of $52,799,104 was “barebones,” but that the State Police would do what was needed to protect the public. “I just want to have the tools in their toolbox so they can effectively do their job,” he said. He said the department could not sustain additional cuts and remain as effective. administration of President Dwight D. Eisenhower in the 1950s. pursuing legislation or ballot measures to raise additional money. funding accounts for more than half the transportation budget. gasoline levy or taxing U.S. companies’ offshore profits brought home. to the U.S. Department of Transportation. for Transportation, a nonpartisan policy research group in Washington. Published: Thursday, April 9, 2015 at 10:34 p.m.
U.S. Sen. David Vitter pledged support today for local projects including the Morganza-to-the-Gulf hurricane protection levee system and the Interstate 49 corridor between New Orleans and Lafayette. Vitter, R-New Orleans and a candidate for governor, said there is potential for state and federal money for the Morganza project. But the Army Corps of Engineers will have to cut costs and economize first. “I’m going to be very focused, hopefully as governor, to line up support for that so we can actually start doing some specific portions of Morganza sooner rather than later,” he said while attending the South Central Industrial Association crawfish boil at Southdown Museum. Vitter also said he would make the I-49 project, which has been strapped for money, a priority in the coming months and years. “That’s the single most important infrastructure project in the state, period, bar none,” Vitter said. Vitter said he is working to inform his colleagues on Capitol Hill of the effects of a federal flood protection executive order President Barack Obama issued on Jan. 30. The purpose of the order, which strengthens flood elevation requirements on federally funded construction projects, is to protect federal investments from storm and flood damage. However, Vitter and dozens of local and state officials are concerned about the potential of unintended consequences. Vitter said he and his colleagues from other coastal states are working to “educate the federal government” on some of the implications of the order. He compared working to block the executive order to the repeal of the Biggert Waters Flood Insurance Reform Act in 2014. “It started from most members of Congress not really understanding what was involved,” he said. Vitter also took issue with Gov. Bobby Jindal’s support for capping the state inventory tax refund to the amount of money owed to the state. Jindal also said he supports repealing the tax, which is paid to parish governments. The state refunds the tax assessed on businesses’ inventories for the full amount. Business owners argue capping the refund would hamper growth while local governments argue that a total repeal of the tax would carve significant portions out of local budgets. In Terrebonne Parish, the loss of the inventory tax revenue would constitute a $10.3 million annual budget hole. However, Vitter supports the repeal of the tax. But he thinks Jindal is going about it the wrong way. According to his recently released plan, “Together Louisiana Strong,” Vitter would repeal the tax and the credit, while adding support money to offset the loss for local governments. “Most of these people are ready, even hungry or desperate, for strong leadership, for having us face the issues and not just kick the can down the road,” he said. bridges are suddenly sparking heavy interest in the Legislature. Despite long odds, House Transportation Committee Chairwoman Karen St.
by $675 million per year by increasing the state sales tax by 1 cent. hours of being announced and without a single vote being taken. infrastructure to handle that,” he said. ”What do we do? Do we sit on our hands?” he asked. at the pump. That could raise up to $750 million per year. from Louisiana’s general revenue fund to one for transportation only. the dollars dedicated strictly for parish needs. momentum for it,” he said. Motorists now pay 38.4 cents per gallon in state and federal gasoline taxes. bridge dollars to State Police. Rep. Mike Danahay, D-Sulphur, sponsor of the House version. Gov. Bobby Jindal opposes any tax hikes without corresponding cuts elsewhere. their final year in the Legislature. state spending at current levels. Trust Fund, which is for transportation only. dollars with money from other sources. Appropriations Committee. It is set for a House vote on Monday. bridge improvements simply will not happen. ”This is going to be a policy decision,” she said.